Successfully Added Intelligent 3D Printing Pen - Adjustable Speed + Temperature, Ergonomic Lightweight Design, Arts, Crafts + Hobbyists (Black) to your Shopping Cart. Introducing one of the lightest 3D printing pens on the market, this fascinating stereoscopic pen lets you bring your art to life in 3 dimensions, so if you can draw it then this pen can make it - the possibilities are endless. Whether you're a hobbyist or professional artist this 3D pen is the most versatile print tool yet and lets you create anything from fine art, scale models or unique decorations. Like a normal pen, this cool gadget lets you draw whatever you wish, only rather than using ink it has a heated patented nozzle that extrudes a plastic filament which, soon sets leaving a touchable 3D creation behind. An 8-speed digital control offers smooth speed change and the adjustable heating temperature let you create at your own pace. With the pen's ergonomic slender body is comfy to hold and use for hours on end so your only restriction is your imagination. 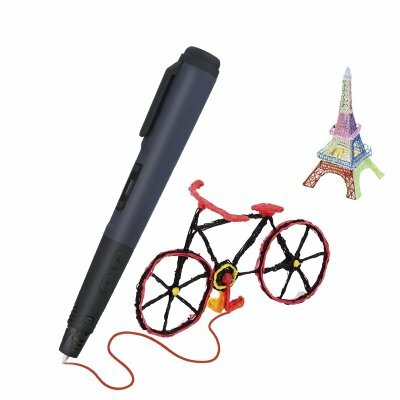 This 3D stereoscopic printing pen comes with a 12 months warranty, brought to you by the leader in electronic devices as well as wholesale electronic gadgets..